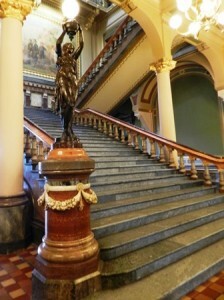 Linda Burton posting from Des Moines, Iowa – There are three unusual things to note about the Iowa state capitol. One you spot right away – it is the only five-domed capitol in the country. The capitol and its five domes are visible from just about everywhere; located atop a sweeping hill above the city; steps lead up and up from the promenade that slopes to the Des Moines River through a grassy park. It is a spectacular sight; with flags flying and gold gleaming, it grabs for attention right away. I was pleased to find plenty of well-marked free visitor parking, in front, in back, and on the west side, and good signage directing visitors to the entry door. But I didn’t find out why the capitol has five domes; the guides at the Visitors Desk said there was no particular reason; “It was just the architect’s design.” The center dome is covered in gold leaf; from inside you can see its ornate beauty and even climb up into it on special guided tours. The four copper-covered domes are trimmed in gold and hold down each of the four corners of the building, but are not accessible nor visible except from the outside. “They’re just there to be pretty,” the guide further explained. 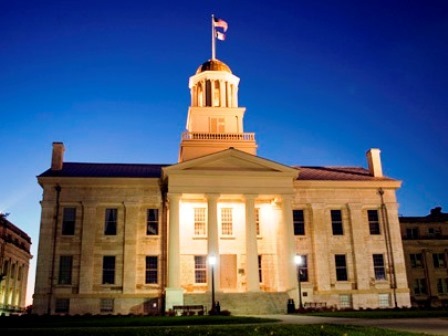 The design is quite pleasing to the Iowans I spoke with; most calling it “very beautiful;” one person commenting that “every other capitol is a disappointment after you’ve seen ours” and calling out the name of one she found particularly “boring.” Capitol rivalry! I entered the building on the Ground Floor, stopped at the Visitors Desk, and took the elevator to Floor One, where my senses were further assailed; the color palette was rich with vibrant blues and reds and greens, and a looking-up sight that fools the eye. 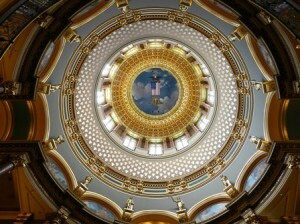 I used the camera zoom to see all the way to the top of the rotunda and still I squinted at the details. It’s a flag, but the flag is part of a larger banner; it has 13 stars and the dates “1861” and “1865” on either end. 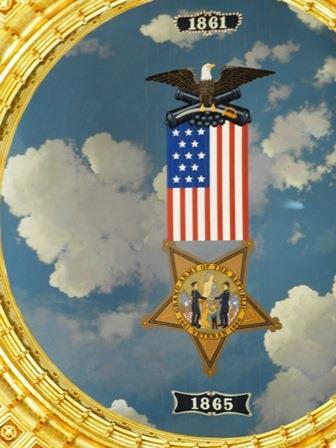 I spotted an eagle at the top and a star at the bottom with the inscription “Grand Army of the Republic 1861 Veteran 1865.” This is a replica of a banner originally painted by Joseph Czizek for a GAR convention in Des Moines in 1922; it was placed in the capitol as a reminder of Iowa’s efforts to preserve the Union during the Civil War. Now we come to the second unusual thing about the Iowa capitol – that design isn’t painted on the ceiling of the rotunda. It is painted on a foamboard-like material, and suspended on wires attached to the sides, some distance below the actual ceiling. The blue sky and clouds were added (painted on the rotunda) during recent renovations. You cannot see the wires from below (although I was able to spot them with a greatly enlarged photo later); it’s a lovely illusion carrying a powerful meaning. A couple beside me had their little one in a stroller; the child leaned back and pointed up; then he turned to his parents and said “Look!” The parents beamed, obviously touched to be able to share the grandeur of the space together as a family. I ran into another young family in the House Chambers; a mom and dad with a boy and girl of elementary age; Dad was explaining government as they entered each new space, step by step. “This is where they make the laws,” he said; and the children settled into chairs behind the representatives desks. Dad referred to his handout from the Visitors Desk. 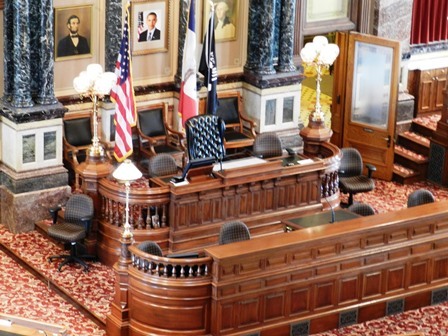 “There are 100 representatives that meet here every year,” he said; “and there are 50 senators that meet in the other chambers.” The children took in the sights, fiddled with the microphones on the desks, and pointed to the portraits at the front of the room. “Three presidents!” the girl said. 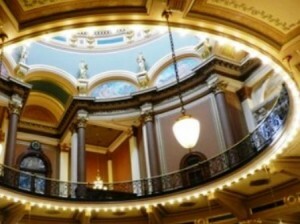 And that’s when I noticed the third unusual thing about the Iowa state capitol. Many state capitols honor Presidents Abraham Lincoln and George Washington with statuary or portraits; although not usually in their legislative chambers. Portraits of Washington and Lincoln were hanging here, and in the Senate Chambers as well; centered right between was a portrait of our current President, Barack Obama, a surprising touch. 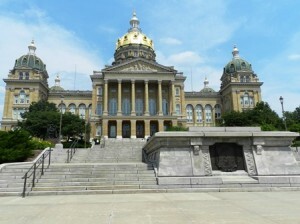 This is the second building to serve as state capitol in Des Moines. A three-story brick building was used for 30 years, until it was destroyed by fire, although planning for a new capitol was already underway. And before that, the capitol was in Iowa City, you can still visit the building there, it’s a National Historic Landmark. The first General Assembly, after statehood on December 28, 1846, recognized that the capital city should be more centrally located within the state and decreed it should be “within two miles of the Raccoon fork of the Des Moines River.” Hence the brick building, which burned; then on April 8, 1870, the legislature approved construction of the current building, establishing a capitol commission to hire an architect and choose a plan, not to cost more than $1,500,000. The cornerstone was laid November 23, 1871, but through a series of problems and setbacks, it was not completed until 1886. The original foundation crumbled and had to be replaced (and a new cornerstone relaid); there were many design changes. One of the architects resigned and one died during construction; their assistants finished the project. The building was dedicated in 1884; in the final report submitted June 29, 1886, the cost was reported as $2,873,294.59, considerably over the original budget. Even then, much of the work had not been completed – no art work was done and the outside steps on the west and south sides were not built. 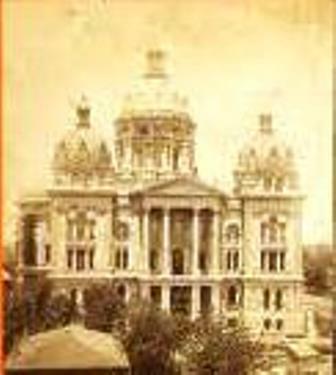 A new capitol commission was appointed in 1902 to get things finished; as gaslights were being converted to electric in 1904, a worker left a candle burning, causing a massive fire that destroyed the ceiling in the House of Representatives and much water damage. Extensive renovation was done in the 1980s-1990s; the dome was regilded in 1965 and again in 1999. From the Walking Tour booklet I purchased at the Visitors Desk, I learned some things I might not have noticed otherwise – for instance, that gold leaf that covers the dome is so thin, 250,000 sheets of it pressed together would measure only an inch! The Iowa Constitution that was signed in 1857 is on display in the office of the Secretary of State; I did not go in to see that. 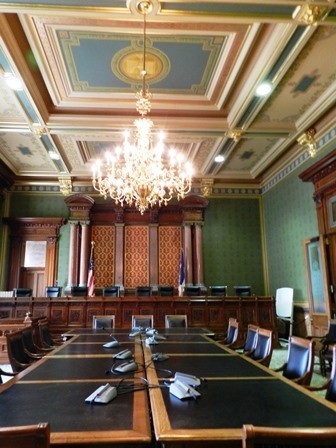 I did go into the Old Supreme Court Chamber; it was used for 120 years but now serves as a committee meeting room; there is a new Judicial Building across the street. The elaborately carved mahogany bench that was specially built for the chamber remains in place. The offices of the Governor and Lieutenant Governor still have many of the original 1885 furnishings, although these rooms are not open to the public. 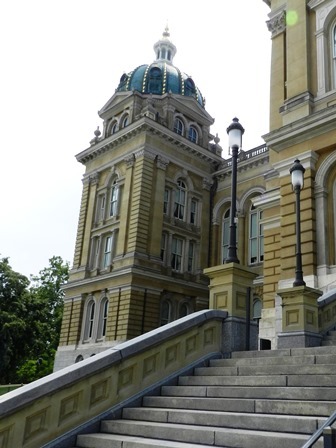 The gas lights at the foot of the Grand Stairway were commissioned for the Illinois state capitol; I was told that Illinois determined them to be a bit risqué, so sent them to Iowa for their use. The 40 foot by 14 foot painting at the top of the stairway is named Westward; it’s a symbolic representation of the westward movement into the state of Iowa, an oil on canvas done by Edwin Blashfield in 1904. On the third floor are six mosaics in arched panels, made in Venice, Italy from small pieces of colored glass; twelve statues are perched high in the rotunda; eight lunettes (half-moon-shaped paintings) surround the rotunda; all designs represent in some way science, education, law, commerce, and the arts. 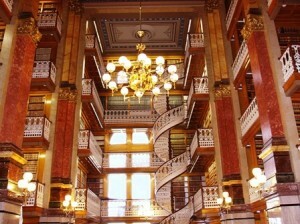 The State Law Library occupies the entire west wing of the second floor and contains over 100,000 volumes; spiral staircases lead to the various tiers of law books and court decisions. The Senate and House Chambers have marble wainscoting and mahogany or black walnut desks and are lighted with impressive chandeliers. It’s almost overwhelming, I thought as I exited the cool building into the hot late-afternoon sun; twenty-nine types of marble; stained glass, mosaic art, quotations carved into the walls. Outside, port-a-potties lined the west-side street and people hauled coolers and folding chairs across the parking lot. The 20th Annual Yankee Doodle Pops Concert by the Des Moines Symphony was set for 8:30; fireworks at 9:45; a beautiful setting on the Capitol grounds, overlooking the city. As I walked to the car, I tried to focus on what impressed me most about the Iowa State Capitol and the answer came in one word: rich. The interior colors were rich, and the meaning behind the ornate décor was rich. 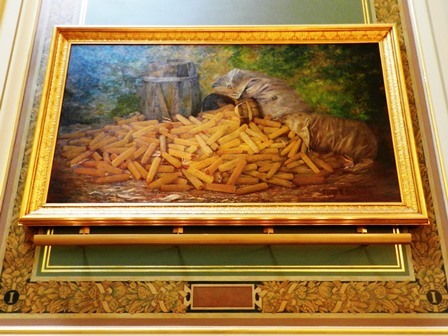 Like that banner suspended high in the rotunda, and my favorite painting of all, an overflowing basket of corn, painted by Iowa native Floyd Brackney and first shown at the Pan-Pacific Exposition in San Francisco in 1915; the name of it is simply Plenty.